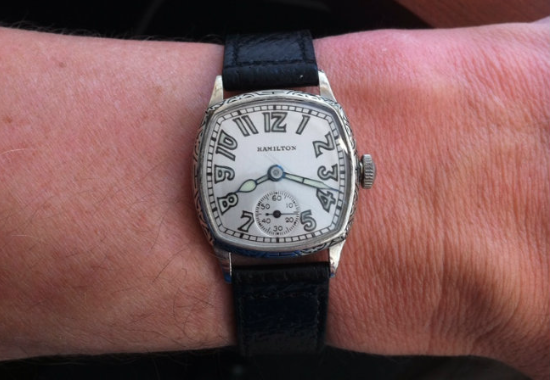 Wrist watches first started to appear at the end of the 19th century and in the early 20th century there was a lot of debate about the use of wrist watches versus the more traditional pocket watches. 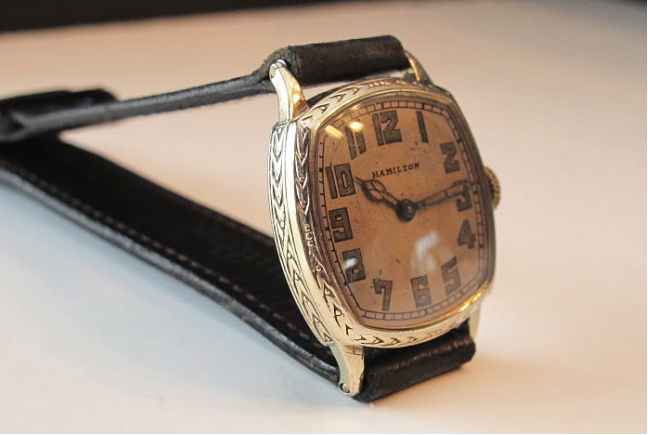 The first World War demonstrated that wrist watches were much more convenient than pocket watches and the first generation of "trench watches" were born. These were often smaller pocket watch movements fitted into modified cases. 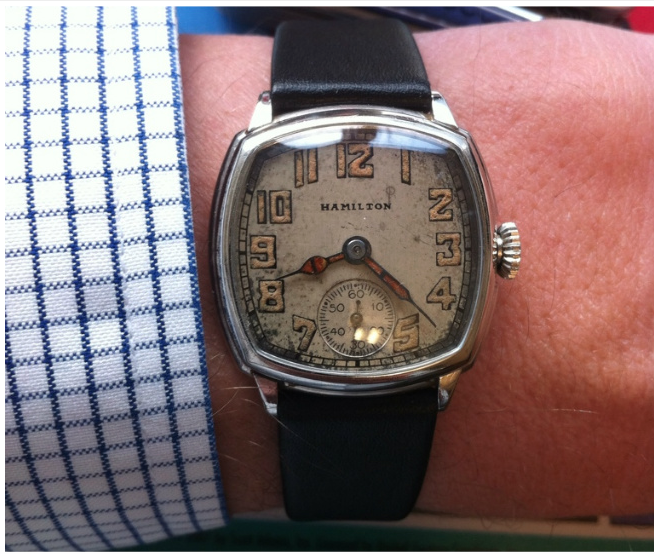 Hamilton's first wrist watches were 0-sized movements in a cushion-shaped case (like a seat cushion). These watches utilized a 17 jewel 981 movement and are a nice sized watch, even by today's standards. They are fairly rare and usually command a premium when sold. 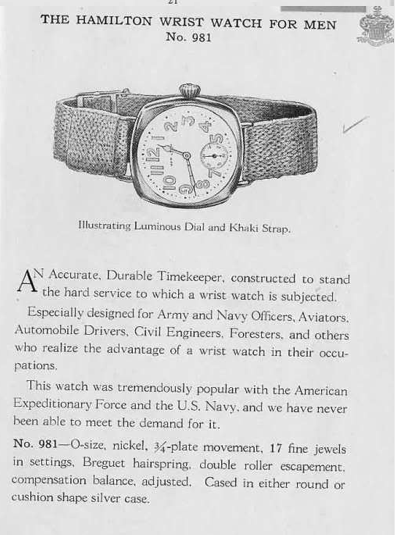 Here's an image from the 1919 catalog. 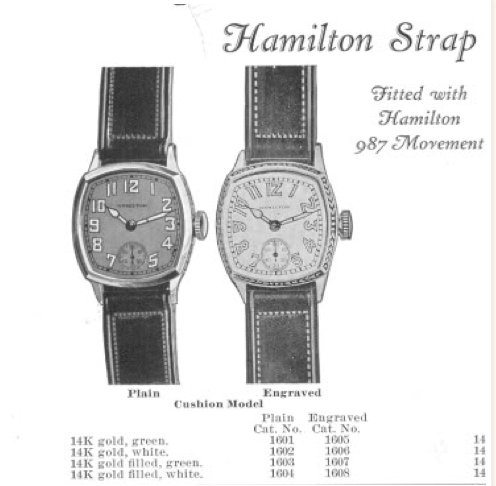 Around 1924 Hamilton introduced a new line of 6/0 sized wristwatches in cushion-shape (sometimes called "cushion form"). Both ladies and men's examples were produced. 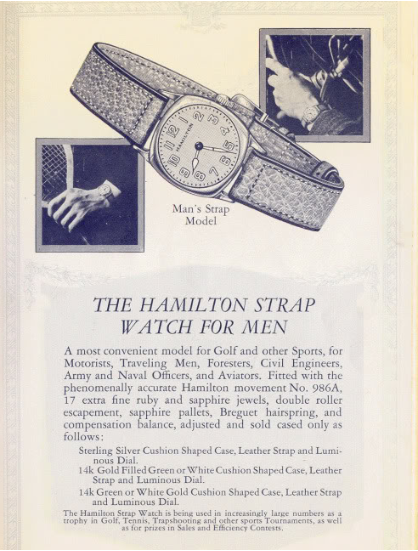 The men's versions were marketed for men of action... the sporting type, where pocket watches just aren't as convenient. Sold gold and gold-filled models were available. 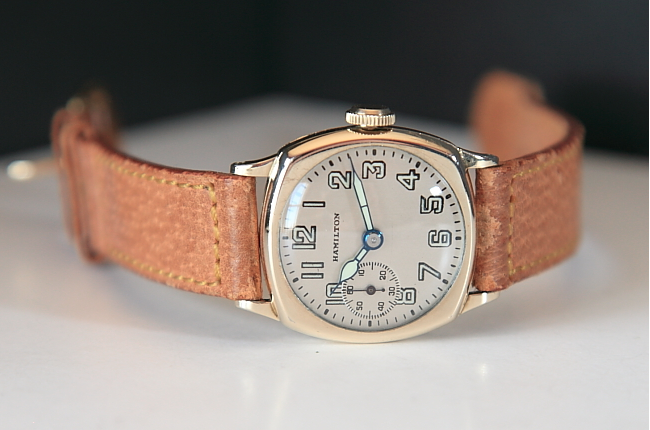 The 986A movement grade typically came without a seconds hand register. Here's a couple of real examples. The first one is a "private label" dial for a jeweler. 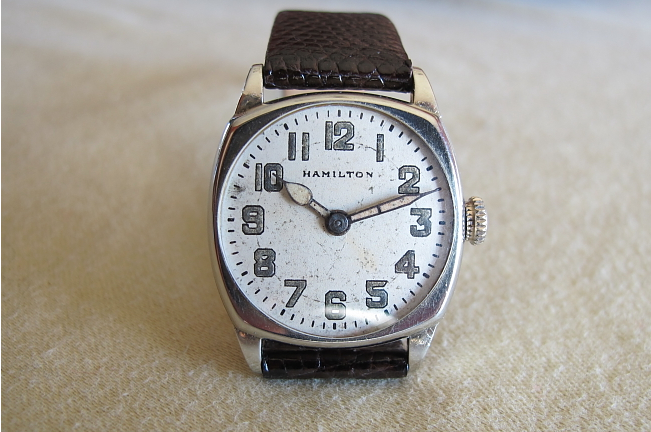 The second fathers a Hamilton dial. Both contain 986A movements. 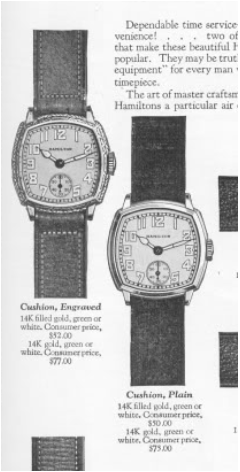 In 1927, the men's cushion was refined and the bezel shape also took on the cushion shape (versus being round). When the 987 movement grade was introduced the addition of a seconds register at 6 became the standard. You can find examples with both the 986A and the 987 movements in this "First Generation Cushion" design. Different engraving styles were also available. This one is referred to as "thunderbird", and is one of my favorites. The dial above has been professionally refinished. 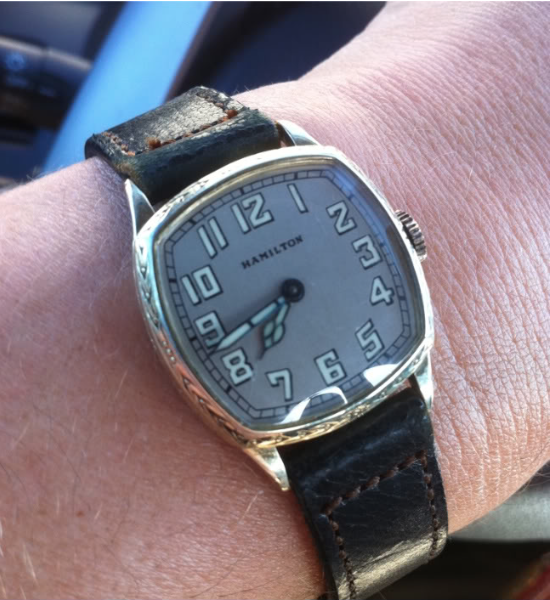 The dial below on a different watch is original. There's a lot of debate about whether or not to refinish a dial. Like most things, beauty is in the eye of the beholder, and it's really a matter of taste. 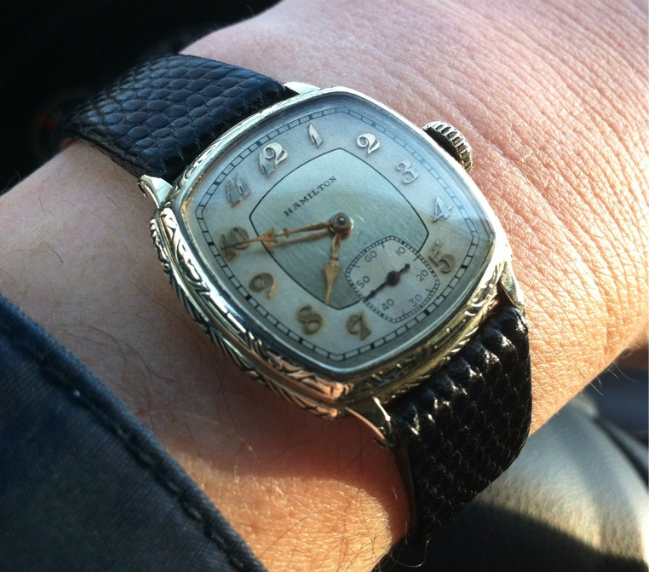 Preference and value will always side with a pleasing original dial though. This one is excellent. Different dials were also available. Most examples are luminous with glow in the dark numerals and hands. You'll also find enamel dials like below and sometimes even applied gold numeral (AGN) dials. 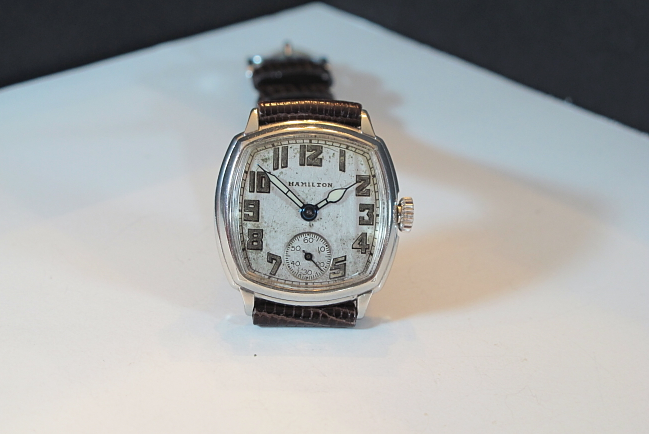 Around 1930 the cushion design was refined again and the principle difference was the center section of the three-piece case extends beyond the front bezel and the back of the case. Although marketed as Cushion-plain and Cushion-engraved models, they are usually referred to as "2nd Generation" models. The same dial layouts continued for the next few years, luminous, enamel and AGN. Here's some nice 2nd Generation Cushion examples. 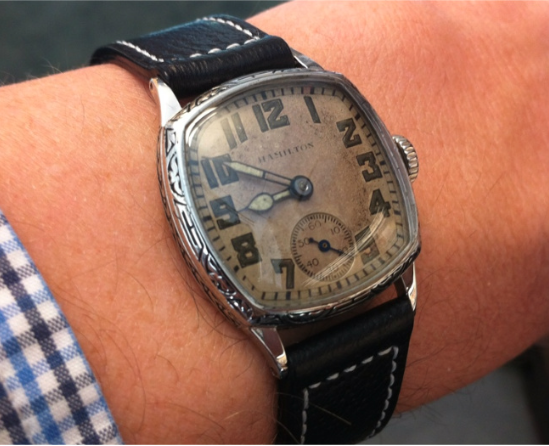 In 1931, the rounded bezel cushion was re-introduced as the "Cushion B". 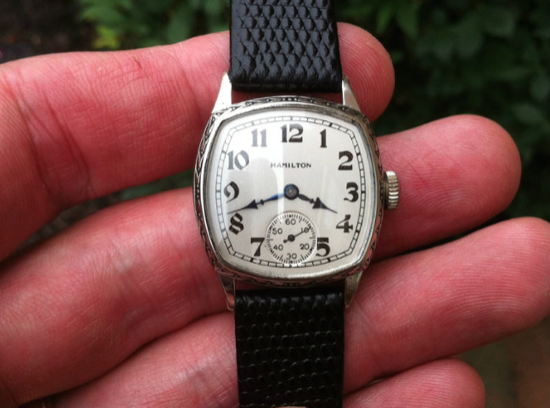 This watch looks very similar to the original 1924 model except it utilizes a 17J 987 movement and has the seconds register at 6. Finally, the last cushion models that Hamilton produced were made during WWII. 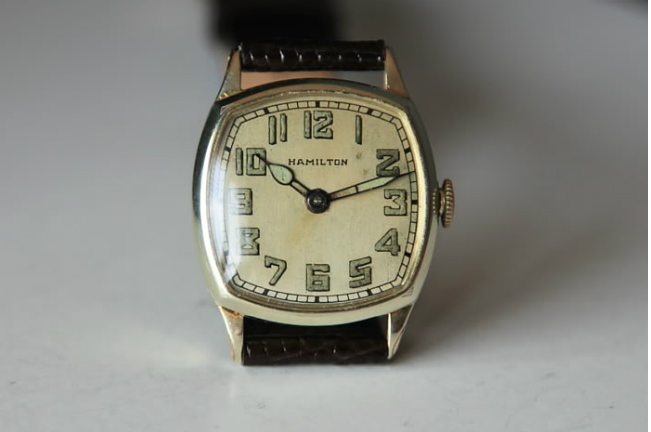 Production was dedicated to the war effort so Hamilton cased spare ladies 986 and 986A movements in 10K gold filled cases. The 986 movements featured a seconds at 9 register and is very popular and usually commands a premium. The example below is outstanding. 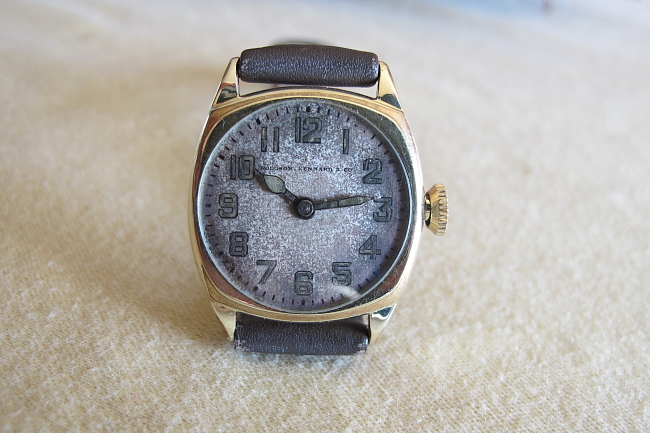 The dial is professionally refinished and the case is virtually unworn. Cushion watches are fairly small, generally around 1 inch in diameter. 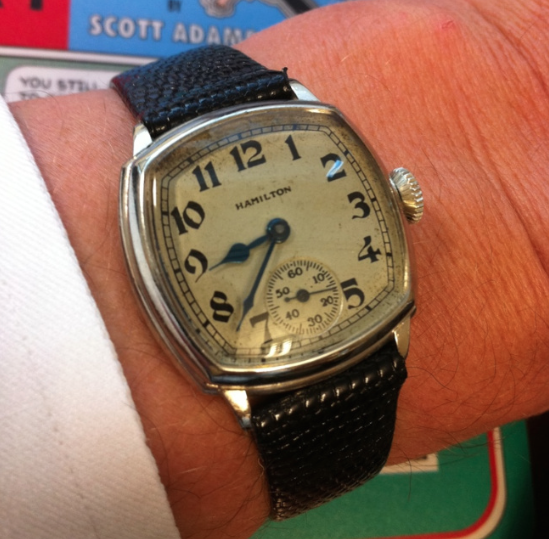 Even being a small watch by today's standards, they are highly collectible and the variety of dials, materials, case styles and generations create a great opportunity for a collection niche.